Nazi Germany 1938. A Jewish family learns soldiers are about to raid their home for not only Jewish people, but also confiscating treasure and destroying anything related to their faith. In the corner of their home is their beloved grandfather clock—hand carved, stained a red-brown, with great brass weights. On the half-hour, it chimes a sweet song; on the hour, it gongs a melancholy tune counting down the time. Quickly, the family rips off the stars of David and silver letters nailed to the clock face: “vulnerant omnea ultima necat,” a Latin proverb translating to “all the hours wound you, the last one kills.” There is a sharp knock at their door. 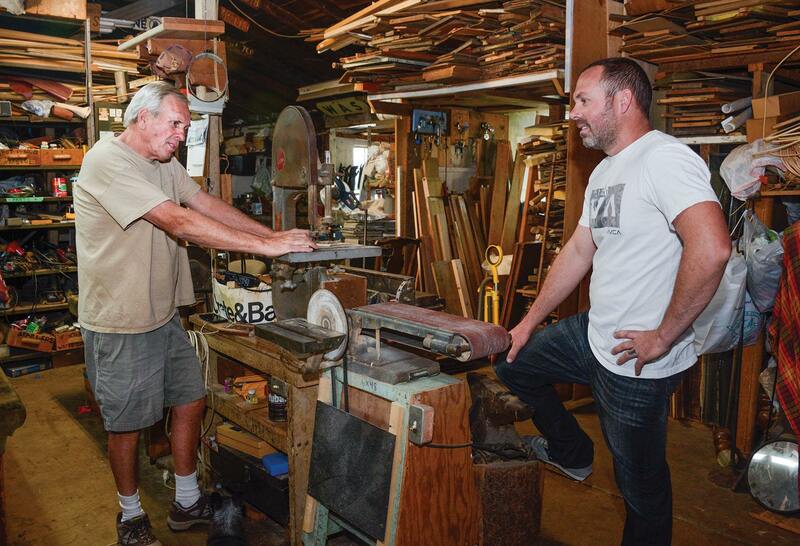 Ken, a La Verne native, has seen the town go from orange groves to paved streets in his years. La Verne Orange Company crates and Lordsburg Water Company manhole covers decorate the store walls. He fondly recalls working as an orange picker when he was 15, protecting the oranges from winter frost by staying up lighting smudge pots until the early morning sun warmed the air. 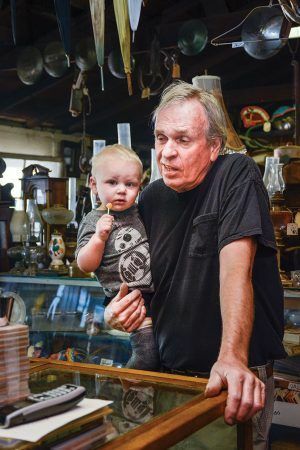 Four generations of the Ruppert family have sold antiques. He first viewed the business by attending the Rose Bowl flea market as a child. Ken opened his first store with his dad Frank on Holt Avenue in Pomona when he was a Mt. San Antonio College student. “He loved the antiques. He was part of the store,” Ken says of his father. But the store was only open for four years as Ken was drafted, sent to Fort Ord and then to Vietnam. When his service was over, he attended California State Polytechnic University, Pomona and studied engineering. He jokes that he did not use the engineering part of his degree much in his antiquing business. “Even if you never use it, I think you come out of college a better person,” Ken says. Once the buildings were empty, Ken filled them back up again. 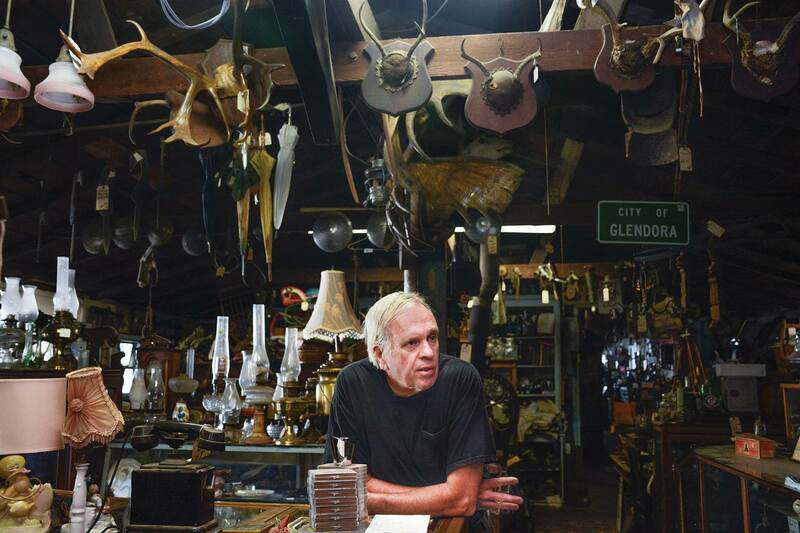 “There’s nowhere else for the stuff to go anymore,” he says. He made his business attending sales at private homes and making offers on anything he liked. “Most of my business comes from word of mouth,” Ken says. Although he doesn’t have a particular theme to his store, Ken prefers to buy items from the 1930s or older. He especially likes the Victorian and old western items. “Anything newer than that has to be pretty funky,” Ken says. He uses that word a lot—“funky.” Much of his inventory could redecorate Knott’s Berry Farm, Ken says. Hanging along the walls are dozens of convex glass photos and paintings—a creepy collectors item, he says—of family portraits, newborn babies or Civil War soldiers in their formal uniforms. “My Victorian pieces sell fast, especially the ice boxes. A lot of people buy them and turn them into personal bars.” He has old Victorian bed frames, baby buggies and even a coffin with viewing glass. “I have a lot of people interested in the coffin. Someone wants to turn it into a coffee table, another wants to turn it into a bookshelf, and somebody else wants it as is—stains and all,” Ken says. The coffin was never buried, Ken stresses, but was used as a decorative casket for bodies at viewings. The bodies were later buried in cheaper, less ornate caskets. Ken has come across many morbid items in his day. He’s currently researching a pair of tombstones that came to him from a man he calls a “rock dweller,” or person who enjoys exploring the canyons and deserts in the south western states. “You can see they have little poems on them, just like the ones in the ghost town cemetery at Knott’s. I always thought that was a funky little thing they came up with, but in my research I’ve found it’s real.” His favorite of the two is the more legible tombstone of a sheriff who died in 1870. It reads: “Fred Bass: A real nice guy, but a real bad shot.” He says the finder swears that he found the tombstones washed up in an Arizona river. The store is deeply ingrained in the Rupperts’ lives. Dusty married his wife Jill on the property. The sunflowers they planted for their wedding now grow wild along the fences every spring. Their children Briley, 4, and Cash, 1, are learning the business along with Kenny’s son Gage, 6. This past fall the children made their first sale: a big pumpkin head. Their $2.25 earnings are framed above Ken’s desk. They defy the warning, “You should never work with family.” “I’d say the best part is that we all get along, but we have our days. What other job lets you yell at your boss?” Dusty jokes. Dusty remembers helping his father very recently bring in a grandfather clock he picked up from a customer for refurbishment. Ken cleaned it, removed the dust in the crevices, then polished the four 28 pound weights and restored the twinkling chimes. Nice article… Ken has definitely come along way from the Pomona Swap meets and auction’s that he did back in 1965/66. Nice to read that he has stayed true to his love of antiquing.